Ah, summer. It’s the time of going to the beach, traveling to near and faraway shores, riding your bike, having a barbecue, eating Popsicles – and making sure that you don’t get sunburned in the process. 1). Thou Shalt Love Silk Ribbons. The iconic Hawaiian Tropic sun care brand has given all of us another reason to love summer: its new Silk Hydration lotion sunscreen. Available in SPF 12, 30 and 50, this luxurious lotion moves beyond typical sun protection, providing ultimate moisturization as well. It’s a joy to use! 2). Honor Thy Skin. It’s a fact – Hawaiian Tropic and Banana Boat products have carried The Skin Cancer Foundation’s Seal of Recommendation for almost two decades. 3). Thou Shalt Avoid UVA and UVB. 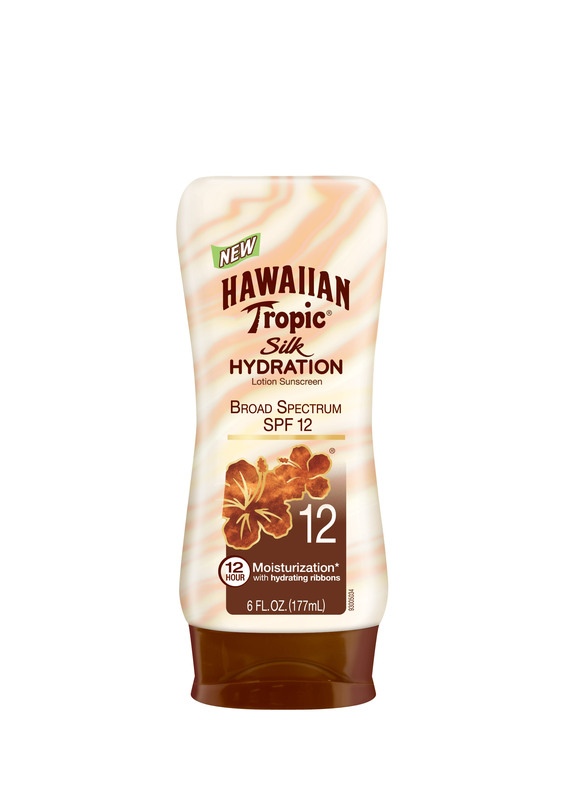 Hawaiian Tropic’s Silk Hydration lotion provides safe and effective broad spectrum UVA and UVB protection that won’t break down in the sun. Brilliant! 4). Thou Shalt Spritz With Spray Sunscreen. Banana Boat now makes it easier than ever to shower yourself with sunscreen, thanks to its new Sport Performance CoolZone continuous spray sunscreen. These clear-mist formulations are ideal for your entire body, but especially handy for hard-to-reach areas like your back, and the back of your legs. Also invisible and rub-free! 5). Thou Shalt Cool Instantly. Banana Boat’s new CoolZone spray sunscreen provides UVA and UVB protection and instantly cools your skin on contact – which is great for those hot, hot, hot, humid days. 6). Thou Shalt Be Natural. Banana Boat’s new Natural Reflect sunscreen lotions in SPF 50 are free of oxybenzone and parabens. Instead, it contains naturally sourced sunscreen with zinc oxide and titanium dioxide that is gentle on sensitive skin, water-resistant and has proven effective against sunburn. 7). Thou Shalt Please Thy Dermatologist. Natural Reflect is dermatologist tested and gentle on sensitive skin. 8). Thou Shalt Be Protected In All Conditions. Natural Reflect was tested in seven real-life conditions – sun, pool water, ocean water, wind, sweat, sand and even 100-degree heat. It works! 9). Thou Shalt Be Protected at 36,000 Feet. You’re not immune to the sun’s strong rays when you’re in an airplane. In fact, up in the air, you’re even closer to the sun. Pack any of these great sunscreens and stay protected. 10). Thou Shalt Go Forth Beautifully. Pack these items in your travel bag for summer and remember – yes, you can take it with you. Don’t forget your copy of my bestseller, The Globetrotter’s Get-Gorgeous Guide, for tips on how to look good and feel good when you travel.